Cambridge Audio Edge NQ review | What Hi-Fi? We first set eyes upon the Cambridge Audio Edge NQ during a visit to the company’s London office around a year ago. So to say we’ve been looking forward to getting our hands on one for the past 12 months is an understatement. At the time, the control app for this and the company’s other Edge products was still in development, along with other bits of fine-tuning and tweaks to the NQ’s immaculate casework. However, we were confident the performance we heard then would translate well when we got it into our testing rooms. The Edge NQ is a pre-amplifier and network streamer, equipped to play music from anywhere on your home network, also packing in Google Chromecast, Spotify Connect, Apple AirPlay, Bluetooth aptX HD, internet radio and Universal Plug and Play playback. Timed to celebrate 50 years since Cambridge Audio’s first product – the P40 stereo amplifier, invented by founder Professor Gordon Edge – Cambridge says the Edge series is its best hi-fi electronics to date, the culmination of starting with a blank sheet of paper and removing time constraints. To begin, Cambridge wanted as short a signal path as possible to significantly reduce the chance of colour or distortion being added to the sound. Capacitors were removed from the signal path and a DC coupled topology was introduced to the circuit board. Cambridge claims this gives an ‘incredibly clean and concise’ signal. The Edge NQ also features a solid-state volume control to ensure channels are kept perfectly balanced, regardless of the volume. 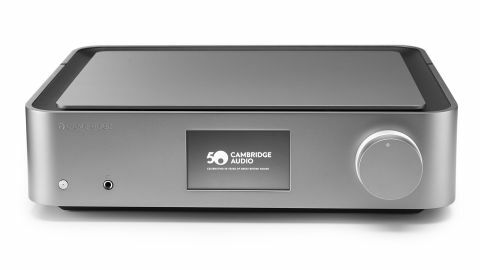 Cambridge is also conscious of delivering a high performance, regardless of the source being used, so the Edge NQ handles any digital content up to 32-bit/384kHz and DSD256 via its USB Audio Class 2.0 input, or up to 24-bit/192kHz via S/PDIF. The ability to handle DSD256 comes as part of Cambridge’s development of its StreamMagic streaming platform, the latest iteration of which is named ‘Black Marlin’ and features a new, faster chipset. The platform now also offers Chromecast compatibility for streaming services such as Tidal, Deezer and Qobuz, adding to the already included Spotify Connect, AirPlay and internet radio – as seen in the company’s Award-winning CXN V2 (£799) and Azur 851N streamers (£1199). Cambridge has taken similar care with the Edge NQ’s aluminium exterior – a feat of determination as much as of engineering. A year after we were first introduced, we’re still in awe of its build and design. Sharing a room with our Aesthetix Janus Signature/Atlas Stereo Signature combination we are using as our reference set-up, the Edge feels decades younger, yet retains that sense of elegance and agelessness that will stop it looking dated for a good while. The front is dominated by a full-colour screen, which displays all the settings and album artwork during playback. There is also a dual input and volume dial, featuring over 30 parts, that has understandably taken a lot of effort on Cambridge’s part. The result is an inner band for switching between inputs, and a chunky outer dial for controlling volume. Given the astonishing amount of work involved in creating something like this, it feels a tad ungrateful to nit-pick. However, one minor issue is the slight looseness of the volume dial; it just doesn’t have that satisfying, heavy tautness of the input selector. But that being the only thing we can criticise about the Edge NQ’s overall build, may give some idea as to the kind of standards set by this unit. The rest of the Edge NQ’s face is clean, but for a headphone output and an on/standby button. As far as power consumption goes, Cambridge has pre-set the unit to revert to standby if it has been out of use for more than 20 minutes – though that can be altered via the Cambridge Edge Remote app. At the rear, you will find the bulk of the Edge NQ’s connections. As well as the unit’s built-in streaming capabilities, there are inputs for unbalanced and balanced XLR analogue, digital coaxial and S/PDIF, USB and HDMI for your TV. For wireless connections, this is where you’ll need to attach the Bluetooth antenna and either ethernet cable or the USB wi-fi dongle included in the box. The Edge NQ will also have the option of adding a fixed line out, thereby disabling the volume control, added via a firmware upgrade next year, and will be available via the settings section of the Cambridge Edge Remote app. Having spent time and money developing a marvellous high-end product, too often companies then package it with an ugly, cheap remote. Not so Cambridge Audio. The remote is attractive and satisfyingly heavy in the hand, and the only shame is how nice it is, given that most of the time we use the Edge NQ with its control app. The remote features all the necessary controls for playback, muting, source selection and saving four presets for source and its volume level, but however nice, you will still be better served by the Cambridge Edge Remote app. It takes a while to get used to, but once we do it proves as well equipped and intuitive as you’d hope from software accompanying kit at this price. Set-up is pleasingly free of fuss, and it locates our NAS drive immediately. The best news, though, is that the Edge NQ remains as talented a performer in our testing rooms as it was when we were afforded our first taste last year. It sounds insightful and impressively clean. You can run your finger over textures, and instruments are well organised with plenty of space between them to breathe and express themselves. Bass response is also a forte the Cambridge appears keen to establish from the off. The presentation is well balanced, with no ceiling to its rich treble, but the Edge NQ is unafraid of delving deep into the low frequencies and rendering them with detail, great rhythmic sense and fine tonality. Walking bass lines are slick and allowed to drive a piece forward, while more electronic pulses are felt as much as they are heard while never being overly portly or soft around the edges. It provides a solid foundation for the Edge NQ’s full-bodied and often luscious-sounding midrange. Voices in particular are treated impeccably with a combination of detailed timbre and impressive scale, while those considerably higher in pitch or more caustic in tone are allowed to break free. Timing generally is a struggle inherent in streaming music, but Cambridge has succeeded here as well. Across all inputs, there is a strong, musical sense of rhythm, which adds to a well-rounded performance. As ever, that is aided by wide and sympathetic dynamic range. The Edge NQ drives tracks forward with the impetus it is able to afford leading notes, while being equally adept at starting or ending a movement with a sizeable bang. That musicality can only be the product of hours-long listening tests to match the work put into the unit’s design and construction. Using the Edge NQ as a pre-amp shows its general character is uniform across its inputs and does a fine service to each of the sources we use. That translates to the performance of its headphone output as well; we could be just as satisfied using the Edge NQ as part of a personal home audio set-up as we are letting it ring through our reference ATC SCM 50 speakers. While we use the Aesthetix Atlas power for much of our test, we also run the Edge NQ through Cambridge’s Edge W power amplifier (£2500). That it sounds great through each is testament to its versatility, but this pre-amp and streamer works best with the latter. Given that they were built to be used together, that’s perhaps unsurprising. Designed with the same ethos as the Edge NQ, the Edge W features only 14 components in its signal path – typically you would expect two or three times that amount – and uses Class XA amplification (100W RMS into 8 Ohms; 200W RMS into 4 Ohms) offering Class A sonic performance but with greater efficiency, shifting the crossover point out of audible range. The Edge W, its temperament so well matched to that of its partner, allows the Edge NQ to perform at its best, accentuating its talents without colouring the presentation or tipping anything over. It is a really accomplished partnership. Accomplished is a word we can use to describe the Cambridge Audio Edge NQ itself. It is a top-class streamer and a rather fine analogue preamplifier too. Add a hugely capable DAC section, and an impressive headphone amplifier, and you have quite some product – all packed into one gorgeous unit to boot.. Simply put, if we had a budget of £3500 for a pre-amp and streamer, we’d buy the Edge NQ. If we had £6000, we’d pair it with the Edge W power amp. While Cambridge may not have rewritten the rules of hi-fi, this is a truly fantastic system for the money.